Bring the people you love closer to your heart by gifting this Dark Outburst Cadbury Chocolates Gift Set loaded with your affection and fondness for them. 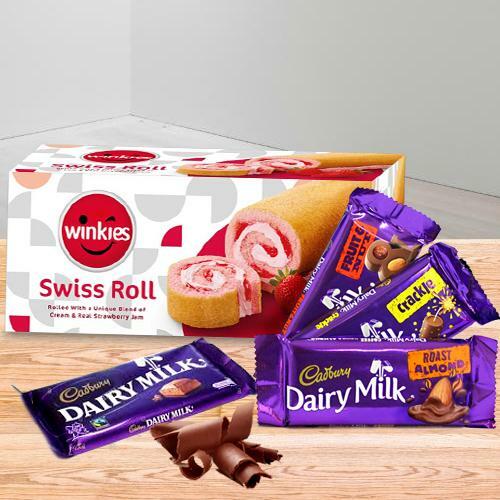 A great Chocolate Gift Set to celebrate with friends, family or colleagues which contains Cadbury Dairy Milk Crackle Chocolate, Cadbury Dairy Milk Fruit and Nut Chocolate, Cadbury Dairy Milk Roast Almond Chocolate, Cadbury Dairy Milk Chocolates and Winkies Swiss Roll Cream-Real Strawberry Jam (185 gm. ).